Today turned into another random day in Istanbul as I stumbled upon hans full of beads, racks of wool yarn, masquerade masks and of course, some charcuterie. 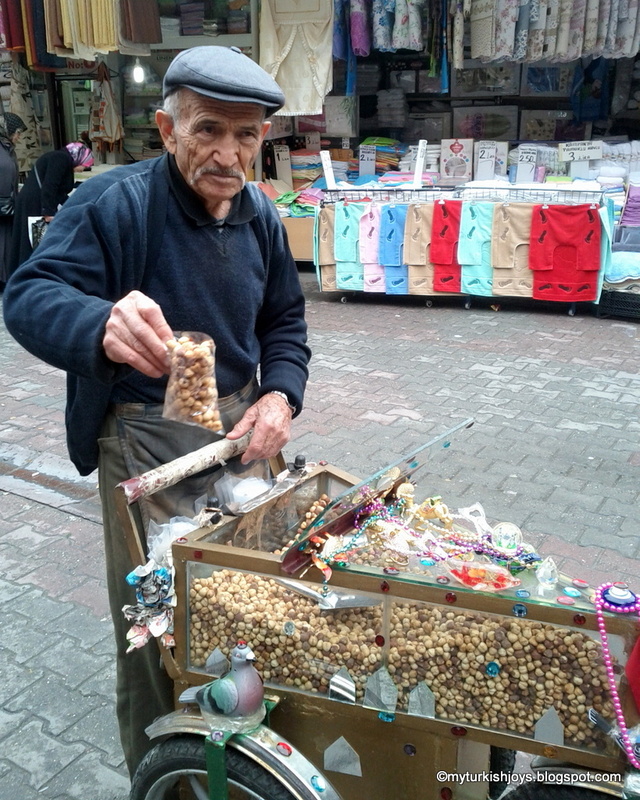 While my friends were plunking down lira for their purchases, we stumbled across the nut man of the Kürkcü Han. He took a liking to my friend's six-month-old baby girl and gave the mom a small bag of hot nuts for free. Turks love, absolutely love, babies here! As he cooed over the baby, he handed out freshly roasted, still warm findik (hazelnuts) to all of us. This Turk would certainly be able sell his wares down Bourbon Street in New Orleans! These nuts were so good that I bought a small bag for only 5 lira and devoured half the bag in seconds. Apparently, he roams around the neighborhood every day so I highly recommend popping in the han if you are in Eminönü. Also, I couldn't resist the gentleman's outrageously-decorated nut cart! Just one more reason to love Istanbul! what a cute old nut seller. mmmmm...warm hazelnuts! Joy, very fun story. You never know when you're going to stumble across a culinary treasure. I have a question for you about the misir carsisi. 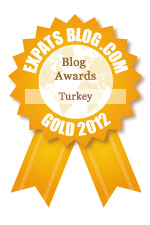 As a chef, which spices would you say that you find to be superior here in Turkey? It could be a good blog post, but having access to both an American market and to all of Adana's bazaars, I'm curious which items I should DEFINITELY be buying off base. @Jake, Thanks for stopping by. From what I understand, most spices generally still come from India and other places. However, for local Turkish flavor, I love the different varieties of Pul Biber from mild to killer spicy, oregano, black cumin seeds and the spice blends such as kofte spice, dolma spice, Janissary Spice, Ottoman Spice - the latter 2 based on pul biber and other spices. The family at Ucuzcular No. 51 in the Misir Carsisi always has high quality spices and makes their own unique blends.